I read Mike’s other book about wandering. His other book The Kindness of Strangers: Penniless Across America deals with Mike’s bright idea to travel across the United States without any money. I’ll have to be honest with you, I don’t think Mike is too smart for doing this. This was in the early 1990s so times weren’t as tough as they are today, but still, seriously, Mike, think ideas through before you carry them out. This book is about Mike and his wife traveling around the world. Yes, Mike manages to find a wife even if he did pull that weird hitchhiking stunt. At the time Mike and Andrea weren’t married yet. So just imagine your boyfriend asks you to travel around the world with him for a year without you killing him along the way. Things turned out alright for the pair. They planned the trip for months. They budgeted $40,000 for their jaunt around the world. They made charts about weather. They bought plane tickets that were good for up to six months. They took very little in the way of clothing. On their trip Mike and Andrea visit six continents. They go a of places they have never been and they go a few places they have been before. They visit the South Pacific. They visit New Zealand, which is a place I would really like to go. They visit Bali. They visit India. They visit Nepal. They visit China. They go to Spain and Ireland. They go to Chile. They go to Bolivia. They even get right at the edge of Antarctica while they are in South America. That is a lot of places to see in just one year. They don’t go home to visit anybody during this time. People do come and see then though along their journey. On several occasions friends and family meet them in various countries for a visit. There are some humorous incidents. For the length of the entire book Mike complains that Andrea has brought a blow-up clothes hanger in her bag. Mike thinks this is weird and frivolous, but later on, he learns to like the hanger. During the journey Mike and Andrea are accosted by carpet salesmen in Morocco and a couple of other countries. They meet some Unarians in South America, which are basically people who have some sort of religion that involves UFOs. Mike and Andrea see a lot of beautiful sights. They talk about how New Zealand makes them sick because it’s so perfect. 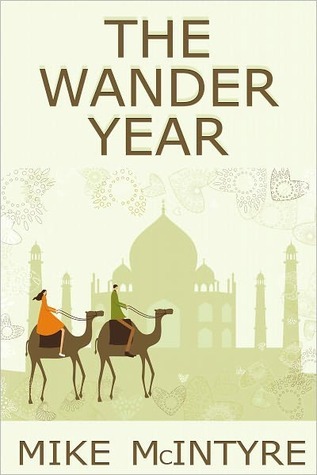 What I liked: I don’t know how it has come to pass that I have read two books about globe-trotting in very little time. I guess it just turned out that way. I do find it interesting to read about other people’s travels. That way, if you’re planning a trip you can use the recommendations and stories of others to get where you want to go. Each leg of the trip is divided into an essay. Mike originally wrote these for either a magazine or a newspaper. It’s nice that he bound them in a book. The good thing about this idea is that you don’t have to read this long drawn out section about one country or another. The sections are short and do not take long to read. The book isn’t actually very long. The e-book version includes either the whole The Kindness of Strangers or a very large sample of it at the back. So don’t look at the page numbers listed for the Kindle version and be discouraged. It’s not really that long. At the end of the book there is a breakdown of costs. Mike and Andrea spend over ten thousand dollars more than they had planned to. They list what they spend on hotels, air travel, other transportation costs and food. It’s kind of neat to see how much money it took them to get around the world. What I didn’t like: This is a nice book and all, but some of it really seems in that realm of not-relateable. How many people have $40,000 dollars lying around that they can blow on a trip around the world? If I had $40,000 it would not be spent on a trip around the world. In fact, if most people had $40,000 it wouldn’t be spent on a trip around the world. For another matter, who quits their job to go on a trip around the world? We’re in the age of keep your job pretty much no matter what. I think people could probably relate more to Mike’s previous trip across the United States without any money than they could to his trip around the world with $50,000 dollars. I think extravagant travel is probably waning in its popularity. Yes, it’s sad, but people just don’t have that kind of money anymore. Through economic inflation and a terrible job market, people don’t have the money to make those trips to Disney World, let alone a trip to South America. I would love to travel around the world some day, maybe not all at once though. I would rather go in short bursts. I may never have enough money to do that. Overall, this book is entertaining. It is interesting. I don’t now how Mike and Andrea managed so well on their very long trip. These two are twelve years older now. I don’t know what they find to spend their time on these days. Enter your email address to get interesting things to read in your inbox.